Marlon Brown-WR Ravens- 12% Owned- Brown had his best game of the season on November 3rd before re-injuring his knee. Against Cleveland he was targeted 9 times and scored two touchdowns on 5 receptions for 54 yards. not counting the Bengals game a week later on the 10th, Brown has scored in four of the seven games he’s played in this season. His biggest enemy is the injury bug and in particular the knee he hurt back in college. He will start this Sunday vs the Jets who give up the 10th most fantasy points to wide receivers. Donald Brown-RB-Colts- 26% Owned- It seems that mid-season pickup Trent Richardson has failed to impress coach Chuck Pagano and Donald Brown has proved more than capable when given the opportunity. Against the Colts last week, the former UCONN Husky and first round pick rushed 14 times for 80 yards and two touchdowns. As it was a breakout game we do not suggest you trip over each other on your way to the waiver wire unless you are in a deep league and are desperate for a RB. Brown will face the Cardinals this week who are very stingy in giving up yards to running backs. Garrett Graham-TE-Texans-25% Owned- A major disappointment so far this season, Graham is another one who had a breakout game last week catching seven passes for 136 yards and a touchdown albeit after fumbling on his first possession. The whole Texans team is in disarray and here too, if you are in need of a TE2 in deeper leagues you might give Graham a try as the Jaguars, the Texans next opponent, yield the 2nd most fantasy points to tight ends in the league. Matt McGloin- QB-Raiders- 1% Owned- Although Terrelle Pryor has not been ‘officially’ ruled out of Sunday’s game against the Titans, in two QB leagues he is worth the wait and see by week’s end. McGloin is coming off a three touchdown performance (no interceptions) and a quarterback rating of 105.9 although admittedly against an inept Texans team. Tennessee is not a favorable matchup but in deeper leagues beggars can’t be choosy. Bobby Rainey-RB-Bucs- 29% Owned- Those who were lucky enough to grab Rainey off of waivers prior to last week’s game against the imploding Falcons, were rewarded with an outstanding fantasy day as the 26 year old posted 163 yards on 30 carries and three touchdowns(2 rushing and 1 receiving). 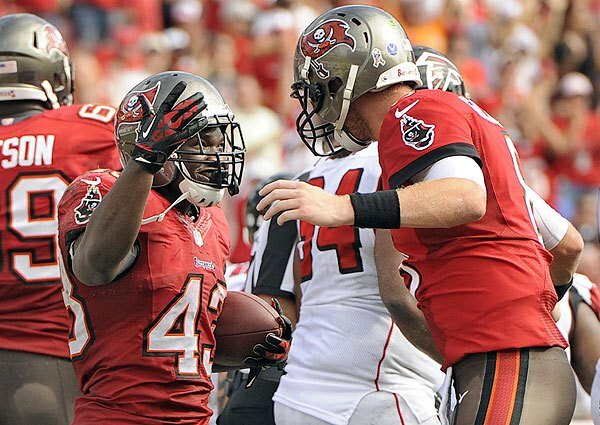 After Doug Martin gave way to Mike James, it appears that Rainey will have another shot this week to impress. He might get more opportunities catching the ball against the pass happy Lions this Sunday so those in PPR leagues take notice. Your thoughts on the blown call by the refs in the game on Monday night ? I was under the impression that the refs had been put out to pasture after the first four weeks of the 2011 season ? McGloin is a tough kid. I hope he succeeds at the next level.